Embarking from Bodrum on a private gulet charter is one of the most popular starts to a very enjoyable blue cruise charter holiday. 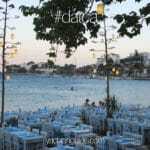 The harbor is located approximately 40 minutes from the Milas Airport, with domestic flight connection possibilities from Istanbul is possible. The harbor is landmarked with the ancient St. Peter’s castle and the tall masts of beautiful Turkish gulets, with the backdrop of white-washed houses spread across the hilltops. Gulet selections are available in the hundreds. There is usually a Turkish wooden boat for every style and budget. One such gulet, offering a charming appeal throughout, is the 23 meter LOA, ‘Gemi Basi’ gulet. She is a possible choice in the affordability bracket for groups of 8 or less. 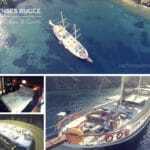 Although the gulet Gemi Basi (pronounced ‘gemee bashee), is a 91’ build, she has been well maintained by the owner, with a last refit in 2008 (known of). The overall interior is home-style. Nothing fancy yet cozy. Current starting charter rate in 2014 is 625€ / day with a one week minimum charter period starting and ending on Saturdays. Guest accommodation on this Turkish yacht charter comprises of 1 aft master and 3 double cabins; each with air conditioning and en suites. The crew quarters are separate. 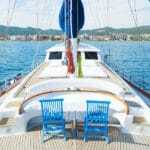 The Gemi Basi gulet provides comfortable cushions which wrap halfway around the alfresco dining area in the aft. The forward deck offers sun mats for each guests for relaxing under the Mediterranean sun, as well as front row seats with a crescent shaped seating area forward. There is a mainsail, mizzen, genoa and staysail for times guests desire to enjoy some of that ‘sailing-at-sea’ experience on a charter gulet. 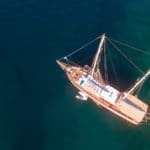 Without having to brake the bank, 8 guests can fulfill a private blue cruise journey on board the Gemi Basi gulet from Bodrum between the months of mid April, right until the end of October.